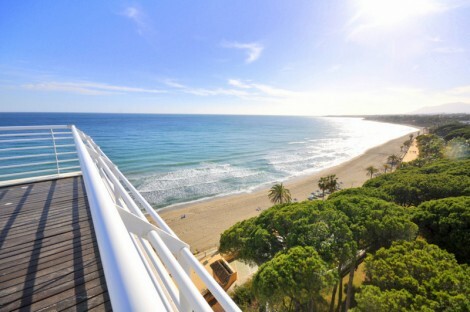 A penthouse of 491m2 in the most luxurious building of Marbella, on second line beach, with a terrace of 251m2 that offers 360º panoramic views to the sea, mountains, Marbella town and the coasts of North Africa. This unique terrace with its various chill-out areas, each with a different charm, offers a feeling of enjoying a villa on the top floor of a luxury building on the best stretch of the Marbella town promenade. Its spacious living-dining room with sea views is spacious and elegant and communicates with a semi-covered terrace, with wooden floor that serves as summer dining; its independent and modern kitchen has a utility room and a timely accommodation for staff if required. This penthouse offers 3 bedrooms with 3 bathrooms, two of them en-suite. The master bedroom has sea views and access to the covered terrace. A single story penthouse offering the best views of Marbella and surroundings. 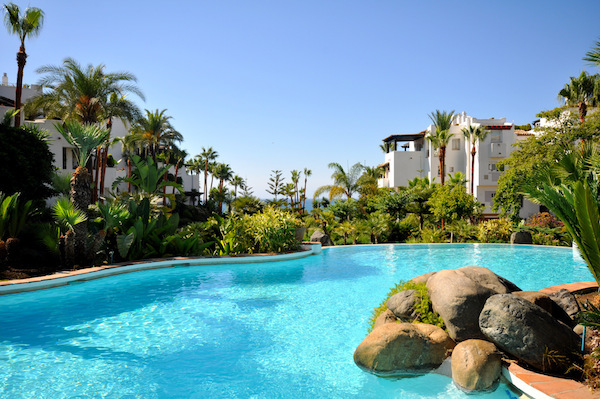 Additional features: Two parking spaces, 24 hours security, several concierges always present, luxury entrance halls and large, leafy and extensive gardens of Andalusian style, with communal pools within an enclosure of peace and vegetation. Please, send me more information about ref W-02AF2R, Penthouse in Beach Side Golden Mile, Marbella Golden Mile or similar properties.